The last ride of the season also means tight scheduling, and fewer co-leaders. But the final, and longest ride of the season was a success! Led by Cappy and Emily, the jumpstreeters (along with rival hotwheelers Estuardo and Ontus) had their ride on a Monday instead of the usual Tuesday, so the rest of the week could be dedicated to time trials and other end of the season celebrations. After the last group photo, the jumpstreeters headed off onto the beautiful east river greenway. Breezing by the familiar dog park and favorite hill where they all earned their hill master badge, the team hit the city streets on the taxi ridden second avenue. The bikers whizzed through the traffic in perfect single file formation, making sure to stay in the bike lanes (or as close to the left as possible when there was construction). After a few blocks we made it back to the east river and rode south to catch our 11:30 ferry! Along the way we took a quick break to look at the faint outlines of newtown creek which we visited on the last ride. Shortly the five jumpstreeters arrived under the large reflective words, “STATEN ISLAND” and were greeted by a black labrador. We cooed and aw’ed but unfortunately the lab paid us no real attention and moved on. Still in high spirits, the jumpstreeters filed into the waiting room and waited impatiently for the ferry to arrive. 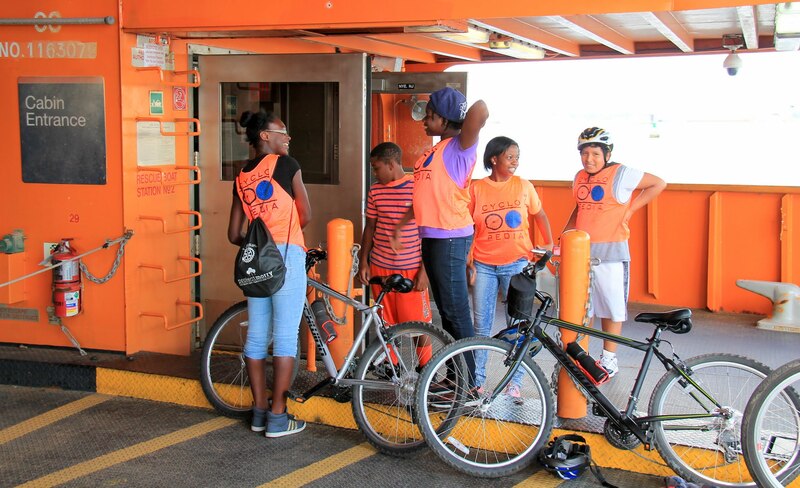 Once on the ferry, Emily, Cicara, Ontus, and Estuardo navigated the upper decks of the ferry while Priscilla, Kayleah, and Cappy stayed with the bikes. Everyone said goodbye to the manhattan skyline as the ferry rolled out into the waters. Once the ferry docked, the jumpstreeters pulled out onto the streets of Staten Island and into the beautiful little heaven that is Snug Harbor. Cappy led the team across gravel grounds right to the not so secret secret-garden. The jumpstreeters dumped their bikes on the ground, half ran to explore the green hedge maze and the other half plopped down on the lawns to eat lunch (defrosted this time!). Unfortunately time was short, and all too quickly the jumpstreeters had to saddle up on their bikes and leave. On the ride out, Priscilla and Kayla found a lovely section of walking paths lined with a dainty bridge and tall trees. There was even a spring on the ground (maybe it was the secret spring we were trying to find at inwood, Eureka!). We rushed off to catch the ferry back to manhattan, speeding down the hill to the ferry station. After taking a few moments to admire the views on the ferry, the jumsptreeters wrote their journals the old fashioned way with pen and papers so we could cut down on computer lab time. 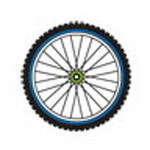 They reflected on the staten island ride, and the cyclopedia season as a whole coming to realize that it was really all ending! The final stretch back to home base included a long, (8.9 miles) but smooth ride back north up the Hudson greenway, and a cut across central park. During the breaks, the jumsptreeters somehow found the energy to find spiky burs to throw at each other. Finally we made it back to MS 114 to wrap up the senic 23 mile ride marking the end of the cyclopedia summer 2014 season! Thanks to all the participants for a great season, and the co-leaders for making it all possible!